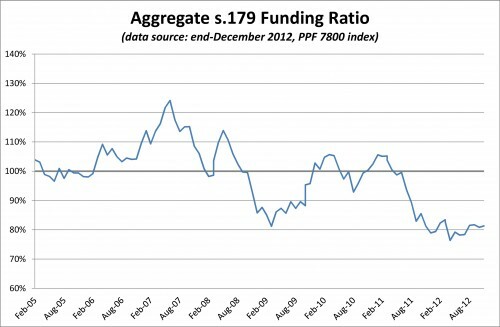 The Pension Protection Fund produces a monthly index update (this month’s release has data taken as at end-December 2012) of the estimated funding position of the defined benefit schemes which would be potentially eligible for entry into the Fund. Total scheme deficits fell slightly during the last month of 2012, from £252.5bn as at end November to £244.7bn at end December with a corresponding improvement in s179 funding ratio to 81.3% from 80.8%. 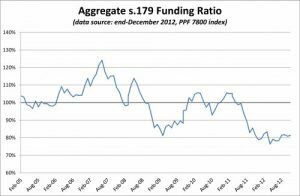 Year on year has seen a small but not insignificant improvement in universe funding positions with the funding ratio rising from 78.9% at year end 2011 to today’s 81.3%. An approximately 20bp drop in 10yr gilt yields over 2012 was a lot smaller than our 2011 experience and growth asset markets generally delivered a sounder investment return.